Coiled and bright green, nothing signals the arrival for spring more vibrantly than the arrival of tangled bundles of fiddlehead ferns at the farmers’ market. You can only find them during a brief window at this time of year, so it’s best to have a plan ready when you lay your hands on some. When you are shopping, look for specimens that are tightly coiled and bright green. Fiddleheads whose tops seems to be unraveling or ones with a brown color are probably not the freshest in the bunch. Once you have them it’s best to use them within a day: They fade from glory more rapidly than most vegetables. If you need to store them in the refrigerator, make sure they are tightly wrapped in plastic. That will buy you a couple of days, but don’t procrastinate. Their flavor is distinctive–there’s nothing else quite like it–but fans of the fiddlehead fern liken it to a mashup of spinach, asparagus, and artichoke. To really enjoy their pure flavor, steam them until nice and tender, add a little butter and salt and enjoy. Oh, but you are feeling more ambitious than that? Of course, you are. Here are some recipes to get you started with your first fresh bunches of fiddleheads this spring. A quick stir fry is the next-easiest way to prepare them after steaming. You can add as much or as little other flavors to the mix as you’d like, but this recipe for Sauteed Fiddleheads with Kate’s Butter strikes just the right balance with the addition of garlic, bacon, and a generous butter finish. This recipe for Fiddlehead Ferns with Brown Butter and Crispy Pancetta combines the boiling and sauteed methods. It’s a little chef-y, but you can’t argue with the combination of crispy pancetta, capers, brown butter, and lemon. For a twist on a classic Chinese dish, try your hand at Szechuan Fiddleheads. Here, they are stir-fried with garlic, ginger, chili paste, and dried shrimp. Szechuan peppercorns contribute their signature numbing heat. Any of these dishes make a good vegetable side dish. But for a complete meal, go for this Trout Amandine with Fiddleheads. The toasty fried almond slices that garnish the dish marry all the flavors of fiddleheads and trout together. Most vegetables reach peak sexiness when battered and fried, and fiddleheads are no exception. The crisp coating in these Beer-Battered Fiddleheads seems to turn up the volume on the vegetable’s nutty notes. Served with an Orange-Basil Dipping Sauce, this appetizer is one your crowd will definitely ask you to make again before the fiddleheads disappear for another year. Yes, frying is messy, but sometimes it’s really worth it. For another crisp and battered variation, try this recipe for Tempura-Fried Fiddlehead Ferns with Ponzu Dipping Sauce. The citrusy sauce cuts the fat inherent in frying and freshens your palate for more. Since fiddlehead ferns are often in short supply, you can use this same batter and frying technique to fill out the dish with other springtime vegetables such as asparagus or mushrooms. Calling all forager and wild food enthusiasts! Give this Spring Wild Harvest Ragout with Fiddleheads, Ramps, and Morels a go. You may have to go foraging for wild ingredients at the exact right moment in the season, but if you assemble everything you need (or make some sensible substitutions), you will be richly rewarded. I know some of you are here for a healthier recipe, given the antioxidant benefits and low calorie count of our star ingredient. I see you! This Mushroom Broth with Fiddleheads is wonderful with or without pork. Because the season is so brief, you might want to consider pickling your fiddleheads so you can enjoy them after they’ve vanished from markets. 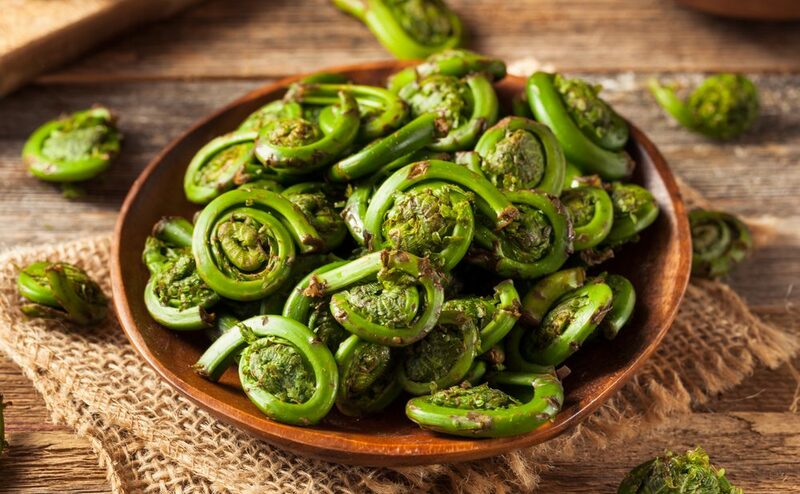 This Pickled Fiddlehead Fern recipe features garlic and Szechuan peppercorns, but you could spice them any way you want. Before you head off to find them at your farmers’ market or forage for them in the field, a reminder. Do not eat your fiddleheads raw. You’ll notice even this Spring Fiddlehead Salad with Poached Egg cooks the ferns first (sub a quick vinaigrette for the buttery beurre blanc if health is where your head’s at). Uncooked, fiddleheads can cause an upset stomach or even food poisoning. Play it safe, and cook one of these recipes. FREE E-BOOK WHEN YOU SUBSCRIBE!